Teaching Theology in the African context presents unique challenges. In general, living conditions in South Africa did not improve much since the first democratic elections were held in 1994. Students have to cope with extreme living conditions whilst also focusing on their distance learning activities. Reflexive research that started in 2010 showed that opportunities could be created to make a greater impact on the students' lives through innovative and interactive study material and teaching methods. The second year course 'World Christianity and ecumenism' provided ample opportunity to be used in an experiment to interact with students during the course of the semester in such a way that they could be challenged to act as change agents in their congregations and communities. By helping students to practise the values and skills learned and to transfer the knowledge gained from the course, they could be motivated to see themselves not only as learners, but also as teachers and educators. This motivated students to take greater responsibility for their own learning and also help to create a more favourable learning environment for others by acting as educators and leaders in their respective communities. By advocating, planning and implementing actions to promote positive change, students could become actively involved in ecumenical activities, upliftment projects and environmental awareness programmes. The positive impact of this study could be expanded into the wider B.Th. programme at University of South Africa through the current process of re-curriculating. Change is a metaphor for life and it seems to become more and more so in the global, digital, post-modern world we are living in. Nearly 20 years after the first democratic government came into power in South Africa, the country is still unstable due to ongoing changes, adjustments and transformation processes on political, economical and social levels, aiming to bring better living conditions and fair opportunities to all South Africans. However, South Africans in general are upset about the (unnecessary) suffering caused by crime, corruption, unstable growth, inadequate infrastructure, unemployment, substandard education, marginalisation, and the ever deteriorating public health system (Leader. co.za 2011). 'Like in the 1980s, the poor are still angry and the government is still out of touch' (Makhanya 2012). Although political change came to South Africa in 1994, it seems as if the political affirmation did not have a measurable positive influence on the day-to-day lives of the majority of the people living in the country. This is confirmed by the position of the country on some annual index lists. It seems as if South Africa tends to make it high only on negative index lists, whilst the scores on positive indexes are low and deteriorating. Our country ranked number 123 (medium low) on the Human Development Report of the United Nations in 2011 (United Nations Development Programme [UNDP] 2011), and number 128 (low and declining) on the environmental development index of 2011 (Yale & Colombia Universities 2012). South Africa ranks amongst the top 10 countries in the world regarding murder and the total number of crimes committed (United Nations Office on Drugs and Crime [UNODC] 2012). The country is also listed as one of the 10 most dangerous countries in the world (Hardy 2012). The number of recorded road deaths proportional to the country's population is close to the highest in the world (Scherer 2013). South Africa has the highest number of people living with HIV in the world (KFF 2012:1). Students have to cope with these issues on a day-to-day basis whilst also focusing on shaping their future through education. South Africa also suffers ongoing high-level skills shortages, which inhibit development and growth, and educators have a moral obligation to try to stop the revolving door syndrome (Subotzky & Prinsloo 2011:177). All of this is in stark contrast to the fact that nearly 80% (Statistics South Africa 2004) of the population claim to be Christians, who are supposed to adhere to such high values, morals and standards that their behaviour is supposed to have a measurable, positive and stabilising influence on the society in general. Christian behaviour has managed, for more than 2000 years, to change the world (cf. Hill 2005; Schmidt 2004) - sometimes for the better (sanctification of human life, morality and health care), but often also for worse (religious wars and intolerance). The gap between the general belief system and day-to-day actions of the South African population is currently widening, and it is signalling an urgent warning to the education structures of the country in general, and more specifically to the Christian educators. In the higher education environment, there is a general need to identify and address challenges and opportunities that arise through change. Society needs active and responsible citizens who are able to live in a world that is constantly changing - socially, economically, politically and educationally (Johnston et al. 2011:8). Curriculum designers and lecturers in theology at University of South Africa (Unisa) are committed to facilitate education that will help to address the abovementioned problems. The aim is to train students to become responsible and active citizens (Oyler 2012:8), with a sound moral vision (Oyler ibid:70) and who are actively involved in community upliftment projects and actions. In line with Unisa's policy on student-centredness, curriculum designers in theology have the opportunity to both improve the quality of the study material, as well as make a positive impact on the lives of the students. Lecturers embrace the opportunity to educate students, not only to pursue diplomas and degrees, but also to become constructive change agents in their respective communities. A change agent is someone whose presence and/or thought processes cause an alteration from the traditional or conventional way of handling of a problem or thinking about an issue. By integrating faith and religious experiences with education, students are motivated to not only pursue knowledge gain, but also to instigate positive change through their studies (Cafferky 2012:5). Christian leaders should be able to reach out to and facilitate change for the poor, the marginalised, the victimised and the isolated communities that are in desperate need of help and betterment, but whom the government is seemingly unable to help (cf. Jackson 2007). • Acknowledgement that the world (and South Africa in particular) has serious problems. • Understanding that these problems have roots. • Analysing some of the current problems and its courses. • Joining others to create possible solutions. Students need to learn how to reflect critically on their place in society and to practice skills and abilities that underlie good citizenship (UNESCO 1997:24). Social change only happens when people take it upon themselves to get involved and make a difference (eds. Astin & Astin 2000:iv). Apart from the political, economical and social problems that South Africans face, teaching theology in an African context presents its own unique challenges. Teaching at a distance also provides the opportunity to bring knowledge and change to the lives of people living in remote or isolated places and communities. Both government and employer policy statements on higher education are increasingly focused on the development of skills amongst graduates that will equip them for careers in a globalised and post-industrial environment (Johnston et al. 2011:97). What is needed is a world-class higher education system that creates new knowledge, contributes to economic prosperity and global competitiveness, and empowers citizens (Johnston et al. ibid:98). Most students are under-prepared for higher education as a consequence of the predominately substandard schooling system (Subotzky & Prinsloo 2011:177). This is worsened by the students' disadvantaged backgrounds and socioeconomic challenges (Subotzky & Prinsloo ibid). Most students also find it difficult to change from face-to-face teaching (at school level) to distance education. The majority of lecturers also come from a background (school and university) of face-to-face education. Although this is not really part of the focus of the research, the different learning theories also have an influence on the difficulty students experience in the process of adapting to higher education (the change from focus on behaviourism and cognitivism to cognitivism and constructivism - Ertmar & Newby 1993). There seems to be consensus amongst academics that theological education finds itself in a crisis (Banks 1999:1-13; Cannell 2006:35-43; Kelsey 1993; Stackhouse 1988:135). This crisis has a long history as it started already in the last quarter of the previous century. One of the problems listed by Cannell (ibid:36) states that theory and practice are in continuous tension and education is not sufficiently concerned with learning. There are also other, more practical problems that these students have to cope with. Due to low student numbers, theology students have to cope without the help of tutors (supplied by the university in courses with large student numbers). The only contact most students have with their lecturers is the general tutorial letters and personal feedback on their assignments. These problems can partly be addressed by focusing on and reworking the curriculum. Oyler (2012:1) says that the curriculum should be the place where students can encounter the world, its histories and people, analyse current conditions and prepare to act in moral and responsible ways. Students need to understand the ideas well enough to explain it to others, but they should also be able to represent it in a new or different way and connect it to their own lives. Therefore the curriculum has to provide opportunities to practice and not only force students to recall concepts learned in an abstract form (Colby et al. 2003:138). Students are motivated to control their own mindsets and to develop a line of sight (cf. Taylor 2009) on specific issues that influence their lives (such as social and environmental issues and ecumenism). They are encouraged to see themselves as both learners and teachers who take responsibility for their own learning and are also encouraged to help create a more favourable learning environment for others (eds. Astin & Astin 2000:19). The goal is to improve the content of the study material and the quality of the learning experience for students, and to have an impact on the lives of students in such a way that they become positive change agents. This can serve as an example that can be incorporated into other theology courses at Unisa, as well as an example for theological teaching at other South African universities. Not all changes could be implemented into the curriculum at once. Full online teaching at an undergraduate level is still to be phased in. Therefore, the study and research done should not be seen as complete or comprehensive, but rather as an ongoing process that provides opportunity for improvement and alteration towards a module that will satisfied the needs of all stakeholders, including government, academics, students and the communities of a developing country. The research question: is it possible to teach undergraduate theology students in the distance learning environment to become effective change agents? The aim of the study was to test if it is possible to achieve change in students' attitudes and behaviour through the creative use of the R2D2 model, enthusiastic, engaged guiding by the lecturer, and stimulating course content. Is it possible to do more than just provide academic knowledge and content through a semester-long theology course? Illuminative evaluation, developed by Parlett and Hamilton (1972), is used for the evaluation of educational programs. It recognises that students respond to the total learning milieu and not to its individual components or the presented content and tasks. Data was collected through a variety of methods, such as observations, interviews, questionnaires, as well as documentary and background sources. This method of research focuses on the actual learning situation (eds. Parlett & Dearden 1977). Different techniques are combined to shed light on a common problem (Parlett & Hamilton ibid:18). The process is conducted in three overlapping stages of observation, inquiring and seeking explanations (eds. Parlett & Dearden ibid:17). At the start of the course, students were informed that the course was restructured and that obtrusive observation (observations done with the prior knowledge of the participants) would be done to assess the success of the R2D2 teaching and learning model (see Figure 1) in changing students' attitudes and behaviour. Students were also asked to complete questionnaires on their learning experience. The questionnaire was constructed and approved in accordance with the Unisa policy on research ethics and it was included with the course material that was sent to all enrolled students for this course. This activity was done anonymously and voluntary. It provided firsthand information from the students - our key stakeholders. A semi-structured approach ensured that students were able to provide feedback by disclosing what they want to, in their own way. Data was also collected from compulsory and voluntary assignment submissions, as well as voluntary written reports that were sent to the lector. Members of the B.Th. task team, with the help of staff from the Department of Information and Strategic Analysis, analysed the information, categorised the findings and compiled a comprehensive summary in the form of a report with the intention to be used for further curriculum development and course revision. The R2D2 model was originally developed as a tool to 'integrate various learning activities with appropriate technologies for effective online learning' (Bonk & Zhang 2006:250). It is also useful for distance education (which could be online as well). The R2D2 model was chosen because of its ability to address the diverse needs of more than one stakeholder. 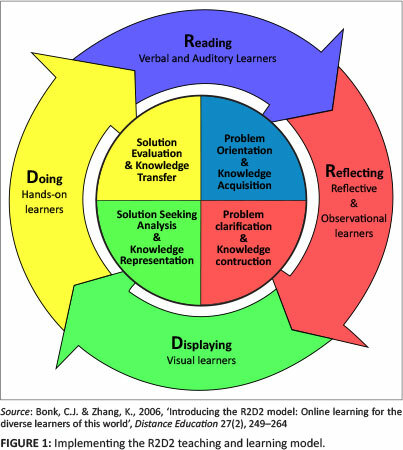 Firstly, this model is intended as a problem-solving wheel that represents the phases of learning (Kolb 1984) and that can guide all types of students (McCarthy 1987), as well as the four types of learning styles (Fleming & Mills 1992; Kolb ibid) through the process, from reading and exploring (gaining knowledge) to reflexive writing (interacting), visualisation and attempts to try out the things learned (practical implementation; Bonk 2010:20). Secondly, it is also a tool that helps instructors to focus on the diverse needs of learners and the large range of opportunities that can be explored to present material and get students to perform tasks, and even to evaluate progress and outcomes. Thirdly, the model can be used by academics to reflect on their teaching practices (Bonk 2010:20). The phases shown in the diagram of the R2D2 model (Figure 1) do not need to follow one after the other. Normally they overlap and spark back and forward referrals, interaction and multi-tasking. More than 10 years ago, the discipline of Church History decided that the study material that would be prescribed for students must be comprehensive and wide-ranging. Students should not be burdened with the problems of having to buy expensive books that they would probably not use again, or that are difficult to get hold of, or that need to be requested from libraries, often with limited resources. Therefore, the study guides are written in such a way that all the material the student needs to be able to successfully complete and pass the module is included. However, in the technological world we live it, it is important that students must be aware that there is a world of knowledge available to them outside the confinements of the study guides, should they be interested to explore the topics further. Therefore, the study guide contains lists of resources for enrichment. Students are encouraged to read as widely as possible, to explore the internet with the help of keywords, to use the wide range of information supplied by libraries, and to search through open access sources. Exploring is not limited to reading and accumulating knowledge from a wide variety of sources. Students are required to interact with the knowledge they are gaining by participating in discussions, debating issues, juxta-positioning opinions, connecting dots and lines, comparing or contrasting different viewpoints or methods, and even turning information into something new or different, for example, converting information given in text format into graphs or charts (Bonk 2010:21). All of this is done by using the learning management system (MyUnisa) and through the submission of compulsory assignments. Although the students were in general aware of social problems, a number of them were surprised to find environmental issues in the course content. The study guide is used as a workbook in which students are asked to reflect on important issues. Students are asked to reflect on cases and scenarios that are linked to the study material. Students need to become aware of and interact with the fact that the Christian religion really changed the world during the past two millennia, and that our faith is suppose to empower us to make a difference in the world. This phase is used to help the students to realise that this course does not only entail academic and abstract activity, but also a positive attitude and their active participation. The course questionnaires stimulated reflection. The questionnaires helped to identify perceptions, opinions and beliefs, but it also succeeded in disclosing to some of the students that what they think and what they actually do are not always in line with each other. The line of sight (cf. Taylor 2009) is often not clear and open. Although lecturers provide extensive guidelines and feedback within the study guides to help and direct the line of thought by the students, there are numerous ways that this activity can be expanded and put into use for the benefit of the students in the online environment. Blogging seems to be a natural way for students to reflect on the readings and the discoveries they make. Students can be instructed to follow the blogs of experts, or to listen to or read keynote speeches from conferences to enable them to gain a wider perspective on the key issues at stake. Discussion forums and annotated reviews can also be used with great success to stimulate this process. Feedback from fellow students, lecturers and even visiting experts are great stimulators and facilitate understanding and deep learning. With the help of technology, it became easy to include graphical content to enhance the impact of study material. Keeping in mind that the younger generations are used to learning through visible media, this is a powerful teaching resource. Part of the prescribed material focuses on Christianity and the environment. Using technology, it is possible to present real-life proof to sustain facts and information contained in the study guides. Displaying does not only include video material and pictures, but also timelines, flow charts, diagrams and other graphical sources. Student activities could include creating mind maps, photo collages and posters (all of which can be done either electronically or in hard copy). Students had to display their ability to put the knowledge gained through the course into use by identifying a problem that has an ecumenical dimension in their communities. A written assignment was done on how the problem was identified and a proposal on how it could be addressed by activating ecumenical networks and action groups in the community. This was done towards the end of the course and changing attitudes were starting to become visible through the submitted work. For lecturers at a distance education institution, this aspect is often challenging. It is not easy to ensure that students can practice what they learned through traditional assessment methods, such as written assignments, tests and exams. During the course of the semester, students are encouraged to participate in practising their knowledge and skills. Within the study guide, scenarios are given as tasks for the students to complete. Full feedback is provided in order to guide the students on the correct procedures, ethical issues involved and actions that are needed to successfully deal with these issues. Small projects are used to stimulate the practice of skills and test the ability to use knowledge and insight. These assignment projects help students to gain experience, confidence and skills. Examples of tasks given are observations, interviews, group discussions, questionnaires, project proposals and report writing. Students' competencies can also be assessed through controlled environment real-world scenarios and problem-solving through online simulations, as well as by allowing students to demonstrate their knowledge and skills though the creation and reworking of knowledge by composing their own books or stories, creating wikis or glossaries, or contribute to existing research projects. Although these tasks and assignments were not compulsory and students were not asked to submit any of it to the lecturer, a surprising number of reports on the work done were sent to the lecturer or posted on MyUnisa. The outer circle of the diagram that explains the R2D2 model was used to focus on the academic side and content of the course. The study guide was developed to include all these elements and to encourage students to participate in all four stages to ensure that they acquire the knowledge and skills needed to have a positive learning experience and to be able to pass the course. Assessment was done through both formative assignments and summative exams in accordance with university policies. Since the course content was reworked in this way (combined with engaged teaching) an average pass rate of 75% was recorded - where the course pass rate was 66% previously. Reworking the module to be more student-centred and supplying additional resources, feedback, interaction and guidelines, had a positive influence on the throughput rate for this course: dropout rates declined and interest in the subject already resulted in one student enrolling for postgraduate studies. The inner circle of the R2D2 diagram was used to focus on the lives and actions of the students. All students contributed with regard to their experiences through submission of assignments. Additionally, questionnaires, assignments and reports were used to test the students' ability to link the issues that were identified and addressed in the study guide with real life situations and problems that students are facing within the communities where they live. Students were encouraged to identify social, religious and environmental problems in their communities. After reflecting on it and consulting with other stakeholders, possible solutions were identified and students were asked to report on the results of their proposals, actions, and projects, as well as the impact of their transfer of knowledge to other people. This part of the course (the feedback) was not compulsory and did not contribute to the final marks. Therefore, the response was low and not all students participated. It could be that only students who had something positive to report participated in the feedback process. It should also be kept in mind that theology students, in general, are involved in upliftment projects instigated or run by their congregations. However, a deliberate attempt to change attitudes and perceptions regarding issues that theological students normally do not engage in, such as environmental issues and the lack of ecumenism in our country, are included in the course and students are encouraged to also take a fresh look at these problems. A total of 30.77% of students contributed through questionnaires and reports. The majority of students (75%) found the R2D2 model of teaching the study material stimulating. Not only did they find the teaching method different in comparison with other Unisa courses, 85% claimed that they did not only gain knowledge and skills from taking this course, but also experienced a change in their personal perspectives and their attitudes towards the issues that were on the table (ecumenism and social and environmental issues). Students reflected on the change in their personal lives regarding their values, attitude, and behaviour. All students reported that they engaged with other people regarding these topics and that they (the students) were involved in a process of educating these people on these subjects. Again, the students' affiliation with churches and congregations helped to provide opportunities to reach out to other people and to put these issues on the table for discussion and action. Six months after they completed the course, 75% of the former students were still committed to activate and enhance positive change projects and actions within their communities and environment. • and home-based care for terminally ill patients. Ecumenical projects did not increase significantly. Only 2% of the students reported that they were involved in an ongoing ecumenical project and 6% stated that new ecumenical projects were in the initiating stages. This is surprising as one of the major focus points of the course is on understanding and implementing ecumenism in our diverse religious society. It seems as if the students understand the principle that underlines ecumenism, but that it is difficult to put this into practice in the real world where denominational lines and traditional tagging of others are still in place. Although a huge portion of the study material focused on the care for and responsibility towards the environment, only a small percentage of the students reported on environmental projects or initiatives. Less than 10% of the students reported any change in their perceptions regarding this matter and only 2% said that they were actively involved in environmental projects, which leads us to conclude that the human need is either much greater at the moment, or that the importance of environmental issues has not been communicated sufficiently - neither through the course material nor the media in general. Although nearly two decades have passed since the first democratic elections were held in South Africa, the country is still unstable and in desperate need of change for the better. With nearly 80% of the population claiming to be Christians, Christian educators should take up the challenge to provide education and training that produce change agents who are able to influence their societies and make a positive impact on the environment, which is in line with the Christian tradition of changing the world. Theological education at Unisa is undergoing a process of re-curriculation. Although not fully online in the undergraduate modules yet, work towards this is going forward in leaps and bounds. One of the second year modules, 'World Christianity and ecumenism', was used as a pilot model to test if students could be helped to become positive, active agents of change in their communities. By practising the values and skills promoted in the course, students were motivated to see themselves as both learners and teachers. They were urged to take greater responsibility for their own learning and personal development. They were also advised to transfer the knowledge and skills acquired through the course to others in their communities and congregations. They were encouraged to practise the knowledge gained regarding world Christianity and ecumenism in their own communities by participating in or instigating ecumenical activities and actions. The overall results provide interesting and diverse conclusions that urge for ongoing investigation and research. It seems as if the human needs overshadow environmental and ecumenical issues. Further study could determine whether this is the case or if these issues are simply not emphasised enough through campaigns, the media and study material to alert students to the fact that caring for the environment and unity in the church are important issues that all Christians should focus on. Overall, the study produced positive results. The feedback from students confirmed that the creative use of the R2D2 model in combination with engaged teaching and constructive use of online tools, as well as stimulating course content could indeed succeed in changing some attitudes and behaviour. Students were encouraged to see themselves as both learners and teachers who reflect critically on their place in society and the role they could play in constructing change and transferring knowledge and skills to others. Engagement in a number of upliftment actions, as well as a few ecumenical cooperation initiatives were recorded. It seems as if the changed curriculum and teaching and learning model implemented in this module created positive outcomes that can be used to build on and that can be expanded on in the near future. It seems as if the existing gap between the Christian belief system and day-to-day practices can be addressed within an academic environment through a curriculum that is focused on positive outcomes and change. Students in theology can become positive agents of change by which whole communities can be reached through the transfer and application of knowledge and skills. Academic qualifications should be more than just a piece of paper to show that the student gained sufficient knowledge. It should also convey the graduate's competency and skills to use this knowledge to the advancement of other people and to activate positive change in local communities.